Unlike most of the other kids in my neighborhood growing up, I dreaded playing hide and seek. In case you need a reminder, this is the game where one person with the moniker “it” counts blindly to ten as the other players scramble to find a good hiding place. The one who is “it” then scampers off to uncover another player and appoint them as the next seeker. For some reason, unbeknownst to me at the time, I always chose paths that were difficult to follow and was often left hiding through multiple seeker appointments. What I have since discovered is that the mere existence of a path does not mean that it can be easily followed. This is certainly true when it comes to defining a design path or guidelines for HDI PCB electronics manufacturing. HDI PCBs are circuit boards designed to maximize the density of surface components, provide a breakout scheme for ICs with high numbers of tight pitched pins or pads, and/or propagate high-frequency signals. The objective is to provide greater functionality in a smaller package. Accomplishing this goal requires that you select a contract manufacturer (CM) that possesses the equipment and expertise to implement the specialization necessary for HDI PCB electronics manufacturing. And to optimize the manufacturing of your HDI design you should follow a well-defined path or design tips that incorporate your design intent and your CM’s capabilities. PCB layout design can be quite complex requiring the designer to make tough decisions about which specifications to assign the greatest degree of importance. The process is further complicated if the design is for a critical system industry such as aerospace, medical devices, automotive or the military, or for high performance like the Internet of Things (IoT) or HDI. Irrespective of the type of board design, the best manufacturing results are obtained when the designer incorporates a design for manufacturing (DFM) strategy that targets the benefits to PCB development and is coordinated with the capabilities of their CM. DFM is not generic. It is a set of rules and guidelines targeting a specific phase of manufacturing like design for assembly (DFA) and design for testability (DFT). DFM can also be focused on a specific board design type, such as HDI. Let's take a look at some important design tips that are intended to optimize HDI PCB electronics manufacturing. The choice of vias is a critical decision that not only determines the equipment and manufacturing steps required but also affects the processing time and additional costs. The use of microvias, blind or buried, helps to reduce the number of layers and material costs; however, the choice of whether to use via-in-pad, dogbone or near pad vias impacts the complexity of the process. The selection of components is always important; however, component selection optimization is more critical for HDI boards. The components for your HDI design determine trace widths, locations, types and sizes for drill holes and stackup. Obviously, performance capability is a prime consideration, but packaging, traceability and availability should also be considered. Having to substitute components or redesign the layout can skyrocket the additional fabrication time and material costs. When component placement is such that via locations are asymmetrically distributed, uneven stress can be applied to the board, which may result in warpage. This can significantly affect yield rate, the number of usable boards per panel manufactured. If components are spaced to densely high power components or signals may introduce electromagnetic interference (EMI) into traces that can impact signal quality. Additionally, parasitic capacitances and/or inductances from nearby pins or pads may affect signal quality. Therefore, it is recommended that EMI modeling to extract parasitics be included during design. One of the advantages of HDI is the ability to use smaller trace widths for signal propagation. Although reduced, trace widths should be designed towards achieving the best signal integrity. This includes using the shortest trace lengths, consistent path impedances, adequate ground planes and digital, analog and power signal isolation. 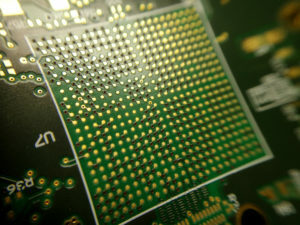 Along with the choice of via, PCB stackup selections also significantly impact HDI PCB electronics manufacturing costs. The material types and number of layers directly influence the number of lamination and drilling cycles required. When making these decisions, costs should be one of the determinants. Following the tips above for HDI PCB electronics manufacturing will assist your CM in making the process as efficient as possible. However, manufacturing HDI boards is not a one-size-fits-all process. To see how design and manufacturing can be integrated take a look at these DFM for HDI case studies. Tempo Automation, the industry leader in fast, precise and high-quality PCB manufacturing, utilizes advanced processing techniques, has the advanced equipment capabilities and expertise to meet your HDI PCB low-volume production needs. And to help you get started on the best path, take a look at this e-book on DFM and enable you to easily view and download DRC files. If you’re an Altium user, you can simply add these files to your PCB design software. If you are ready to have your design manufactured, try our quote tool to upload your CAD and BOM files. If you want more information about HDI PCB electronics manufacturing or tips to improve the efficiency of your development, contact us.